Productivity of Money | Fourth Dimension Inc. In our previous article, we have discussed briefly some of the higher values of finance. But values are only one aspect of the right use of money. The other more pragmatic aspect is efficiency and productivity of money. This article looks at this subject in a deeper and more holistic perspective than the technical definitions used in modern accounting and finance. Higher values are only one aspect of the right use of money. The other aspect is efficiency and productivity. We have said that money is a force of circulating interchange. The quantity, frequency and velocity of this circulation or interchange is an important factor behind the prosperity of a community. But for a healthy and balanced prosperity or economy it must be a circulation, which leads to a tangible enrichment of the human, and terrestrial life in terms of efficiency productivity, quality, assets or well-being and not an unproductive circulation driven by speculative trading. As many experts pointed out, one of the main causes of the present financial crisis is that speculative trading of the “casino economy” has overwhelmed the real economy, which produces tangible goods and services. So, efficiency and productivity, which lead to tangible prosperity or enrichment of life, have to be some of the core values of finance. Money is a vital force and energy and has to be used with as much efficiency and productivity as physical energies and resources like coal, oil or electricity. We need not exactly follow the technical definitions of efficiency or productivity in the specialized engineering or accountancy literature. For our purpose we may define efficiency as minimizing waste and maximizing return. Productivity of money may be viewed in terms of fulfillment of human needs and value-addition. Minimum waste means money-force is used optimally with a focused flow towards the intended purpose and priorities, which enriches life without scattering and diversion into unproductive activities. The other important part of efficiency is simplicity. The financial system as a whole like for example instruments, process and the tax structure has to be made as much simple as possible. This applies especially to financial instruments, which have to be simple and easy to understand and use even for the common man. The main purpose of financial instruments has to be to ensure a smooth, fast, productive and widespread circulation of the money force throughout the society. But, if the financial instrument becomes too highly sophisticated and complex which only the expert can understand and use, then it tends to concentrate wealth in a few clever and nimble financial manipulators with expert knowledge like hedge managers. Such complexity and sophistication of instrument may be to a certain extend unavoidable in a global, interconnected and fast-moving financial network. However, the creative brains in finance also have to think out how to simplify the system and innovate instruments or process, which lead to a more equitable economic order. In a deeper perspective this equity is part of efficiency because an economic system in which wealth accumulates more and more in the pockets of a few unproductive speculators and manipulators cannot be considered as efficient. A truly efficient financial system or economic order encourages and rewards honest, hardworking, productive and innovative creators and the generous distributors of wealth; it discourages and ultimately weeds out those who try to make easy money through dishonest trickery, manipulation or unproductive speculation. As Juan Samavia, Director-General of International Labour Organization, writing on the meltdown states, “we have to come back to the basic legitimate function of finance which is to promote the real economy – to lend so that entrepreneurs can invest, innovate, produce jobs and products” and create public policies and smart regulation that rewards hard work and enterprise once again. Productivity of money may be viewed in terms of two factors: effective fulfillment of human needs and progressive value-addition to the human and terrestrial life. Fulfillment of human needs means the satisfaction of the basic needs of the body and also the legitimate needs of the mind, heart, life and soul, as they raise in the course of human evolution. We have briefly discussed these evolving human needs earlier. The other aspect of productivity is value-addition or enrichment. 1. Investment in fixed assets or infrastructure like building, machinery, roads, real estate, power. 2. 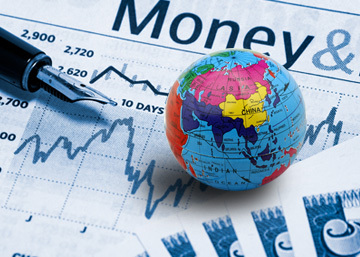 Investment in working capital for the production of goods and services of various kinds. 3. Investment in quantitative expansion of the first two, which means expansion and diversification. 4. Investment in new technology, systems, practices or research and development, which lead to a more efficient, productive or cost-efficient utilization of available resources, or which leads to an altogether new product or service. 5. Investment in human capital in the form of salary or education and training of people for knowledge-enhancement, employability, entrepreneurship or skill-development; rewarding hard work, creativity, innovation, achievement and enterprise; incentives for motivation and for acquiring and retaining talent. 6. Investment in social capital like for example creating employment opportunities, poverty-alleviation, healthcare. 7. Investment for enhancing the ecological sustainability of our planet. 8. Investments in education, motivation, communication, dissemination, implementation of or organization of higher values and ideals which lead to the mental, moral, aesthetic and spiritual development of humanity. The last three belong to the moral or philanthropic dimension of finance. The management or government of each organization, community or nation has to find the right mix of priorities for funding among these eight domains of enrichment depending on the nature and the evolutionary needs or stage of development of the group.